As an Admin, you're able to select peer reviewers for your employees and/or override any peer selections made by individuals or managers. In this article, I'm going to show you how to do this. You'll want to set up the review and select either "managers choose peers for their direct reports," or "employees choose their own peers." It won't matter because you'll be skipping this step as you choose peers for them. Learn more about review setup here. 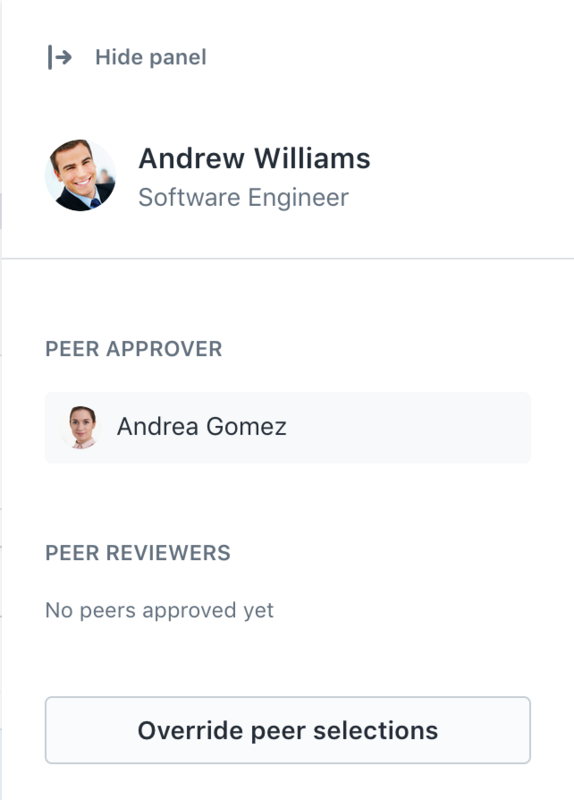 Once you launch the review, you'll skip the Peer selection kick off email (this would be the email that sends to managers or employees to choose peers, but since you'll be choosing them, this shouldn't go out). Instead, click on "Create tasks". This will take you into the peer selection stage within the review cycle. 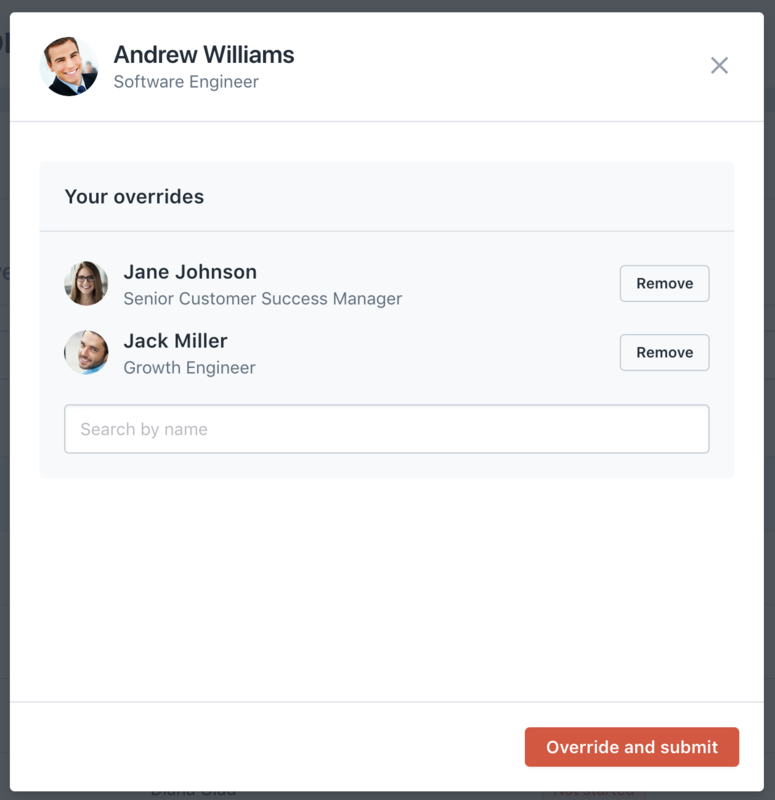 Once in the peer selection stage, you'll want to click the name of the employee you want to choose peers for. This will present you with a reviewee edit panel. In the peer selections pop up click "Override". Type in those who you want to review the person Example below: Reviewee is Andrew Williams and we've chosen Jane Johnson and Jack Miller to review him. Once you have completed selecting peer reviewers click "Override and submit" to save your changes. Note: If you get a "cannot add peer reviewer" notification from the system, this probably means that the person you have chosen as a peer is already reviewing the reviewee as a direct report or manager. 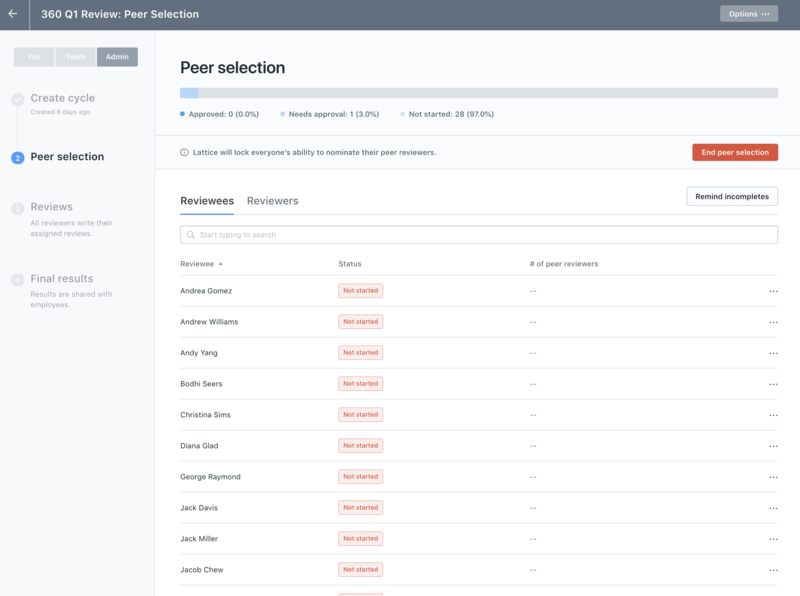 Once you have added peers for everyone in the review cycle, you'll click "End peer selection" and move on to the run reviews stage. To learn more about what running a review cycle entails, check out this article.